At the Annual Crab Feast on October 27, 2018, Lee Benaka and Clifford Hutt were presented with Certificates of Appreciation. 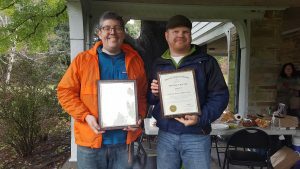 Lee was recognized for his service as Treasurer from 2008-2018 and Cliff was recognized for his service as President from 2006-2008. The Chapter is very grateful for the excellent service and continued contributions of both Cliff and Lee. Thank you! Clifford Hutt and Lee Benaka receive awards. Next story Annual Crab Feast a Success!